With apologies for the bad, hastily snapped photos, I'm going to offer up a case study in why knitters should force themselves to block their swatches. Remember yesterday's debacle with the Moto Vest? It knits up quickly in a bulky yarn, and I approached it with the attitude that the first few inches of the scarf portion were the swatch, since the pattern is more recipe than sized directions. My initial take was that the sizing was off significantly, and I wasn't wrong. But it changed radically with blocking. The rib opens up significantly with blocking, and I should point out that this wasn't aggressive, pin it to the limits blocking, this was a gentle hand wash followed by a soft "do your own thing" kind of block. The back piece is almost double in width. I want it to be a bit wider, but will probably add one rib on either side, not the 10 stitches per side I was contemplating. And, the length of the scarf has opened up as well, giving me the correct measurement there. 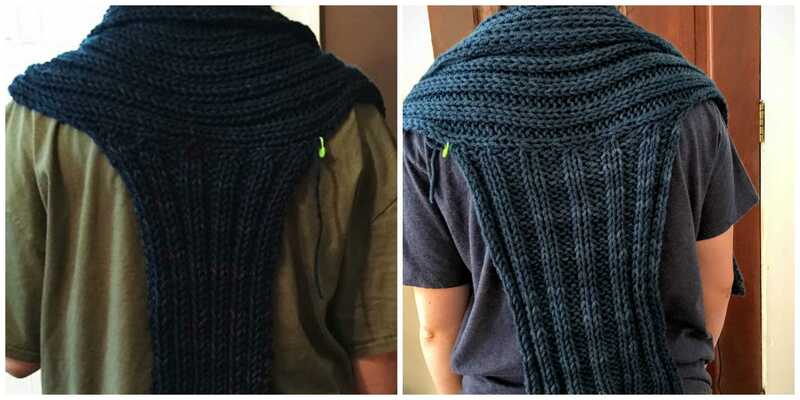 To recap, had I used the unblocked piece as my swatch, I would have added several inches to the scarf collar and knit a much bigger back, ending up with a piece fit only for Godzilla. As it is, the verdict is still out on my Moto vest. I've picked up more of this yarn off of Plucky destash so I can reknit the back wider, a couple of inches shorter, and perhaps with a bit of cable decoration. And I think it will work.